Audrey J. Weiss, Ph.D., Marguerite L. Barrett, M.S., and Roxanne M. Andrews, Ph.D. In this Statistical Brief, we use historical HCUP inpatient data from 2003 through 2011 along with early 2012 data from nine HCUP States to develop national quarterly projections of 2012 and 2013 aggregate hospital costs, average hospital costs, and total number of discharges. Data are presented for maternal patients, neonatal patients, and patients in three nonmaternal and non-neonatal age groups: 0-17 years, 18-64 years, and 65 years and older. Growth in actual and projected hospital costs and utilization is provided by age group for four nonmaternal and non-neonatal types of hospitalizations: medical, surgical, injury, and mental health. Differences greater than 10 percent between annual weighted estimates are noted in the text. Because analyses in this Statistical Brief are based on all discharges from all States weighted to a national level, the values may differ slightly from results reported from the HCUP Nationwide Inpatient Sample (NIS). Table 1 presents aggregate hospital costs, average hospital costs, and total discharges for all inpatient hospitalizations by patient age group in 2003 and 2011 (actual values adjusted for inflation) and for 2013 (projected values adjusted for inflation). The average annual percentage change from 2003 to 2011 (actual change) and from 2011 to 2013 (projected change) is provided. Changes in aggregate hospital costs are influenced by changes in average hospital costs (costs per discharge) and total number of discharges. Between 2003 and 2011, aggregate inflation-adjusted hospital costs grew for all age groups, with 2.1 percent average annual growth overall. Costs are projected to continue to increase through 2013, but at a slower rate. Overall, this cost growth is driven by growth in the average cost per discharge, with virtually no growth in the number of discharges. Among patients aged 0-17 years, inflation-adjusted aggregate hospital costs from 2003-2011 increased substantially for surgeries but decreased for injury hospitalizations. These aggregate costs are projected to increase for all types of hospitalizations through 2013, driven primarily by increases in the costs per discharge. For all types of hospitalizations, adults aged 18-64 years experienced increases in aggregate hospital costs from 2003-2011 and for projected costs through 2013. This growth was highest for mental health, which had growth in the number of discharges and the costs per discharge. Among adults aged 65 years and older, aggregate hospital costs increased for all types of hospitalizations from 2003-2011, with injury showing the most rapid growth. Growth in aggregate costs was driven largely by growth in costs per discharge and only slightly by growth in discharges. Surgery was a notable exception, where discharges fell slightly. Aggregate hospital costs are projected to increase at a lower rate between 2011 and 2013 than in previous years. Aggregate hospital costs adjusted for inflation increased by an average of 2.1 percent per year between 2003 and 2011. These costs are projected to continue to increase through 2013, but at a somewhat lower rate (1.3 percent per year). In 2003, aggregate hospital costs (in 2013 dollars) were $338.7 million, and they are projected to reach $411.8 million in 2013. Overall, the growth in actual and projected aggregate hospital costs is driven by growth in the average cost per discharge (2.0 percent actual average annual growth from 2003-2011 and 1.9 percent projected annual growth through 2013) with virtually no growth in the number of discharges (0.1 percent average annual change from 2003-2011 and -0.5 percent average annual change through 2013). Between 2003 and 2011, aggregate hospital costs grew for all patient age groups, exceeding 2 percent average annual growth for patients aged 0-17 years (2.3 percent), neonates (2.5 percent), and patients aged 18-64 years (2.7 percent). Aggregate hospital costs are projected to continue to increase by more than 2 percent annually through 2013 for neonates and patients aged 0-17 years (2.3 percent and 3.3 percent, respectively), but they are only projected to increase by 1.6 percent for patients aged 18-64 years. Average hospital costs (costs per discharge) adjusted for inflation increased by an average of 2.0 percent per year between 2003 and 2011. These costs are projected to continue to increase at about this same rate per year (1.9 percent) through 2013. In 2003, average hospital costs (in 2013 dollars) were $9,100, and they are projected to reach $11,000 in 2013. Between 2003 and 2011, average hospital costs grew by more than 2 percent for all patient age groups except adults aged 65 years and older (1.4 percent growth per year). Average hospital costs are projected to continue to increase by more than 2 percent annually through 2013 for neonates (2.3 percent), maternal patients (2.4 percent), and patients aged 0-17 years (3.8 percent). Total hospital discharges remained relatively stable between 2003 and 2011 and are projected to decrease slightly through 2013. The overall number of hospital discharges changed minimally at 0.1 percent average annual growth between 2003 and 2011. Discharges are projected to decrease by an average of 0.5 percent per year from 2011 through 2013. There were 37.4 million total hospital discharges in 2003, and this number is projected to be virtually unchanged in 2013 at 37.3 million discharges. There was modest change (less than 1 percent) in the number of hospital discharges between 2003 and 2011 for four of the five patient age groups, ranging from -0.9 percent average change per year for maternal patients to 0.7 percent average change per year for adults aged 18-64 years. The only exception was for patients aged 0-17 years. This group had a noteworthy change in the number of hospital discharges, decreasing at an average rate of -1.7 percent per year from 2003 to 2011; this rate is projected to slow to -0.5 percent change per year through 2013. Finally, maternal patients are projected to experience a change of -1.1 percent per year through 2013. Figures 1-3 show the average annual growth rate between 2003 and 2011 (actual) and between 2011 and 2013 (projected) in aggregate hospital costs (inflation-adjusted), average hospital costs (inflation-adjusted), and total discharges by hospital service line for nonmaternal and non-neonatal patients aged 0-17 years (Figure 1), 18-64 years (Figure 2), and 65 years and older (Figure 3). Figure 1. Growth in aggregate hospital costs (inflation-adjusted), average hospital costs (inflation-adjusted), and total number of discharges, patients aged 0-17 years, 2003-2013. Figure 1 is a bar graph showing the 2003 to 2011 actual average annual growth and the 2011 to 2013 projected average annual growth for medical, surgical, injury, and mental health hospitalizations. Inflation-adjusted costs are presented in 2013 dollars. Percentage of actual average annual growth, 2003 to 2011. Medical: Aggregate costs: 1.55, Average costs: 3.69, Total number of discharges: -2.07. Surgical: Aggregate costs: 4.02, Average costs: 4.76, Total number of discharges: -0.71. Injury: Aggregate costs: -0.84, Average costs: 2.32, Total number of discharges: -3.09. Mental health: Aggregate costs: 1.66, Average costs: 1.18, Total number of discharges: 0.47. Percentage of projected average annual growth, 2011 to 2013. Medical: Aggregate costs: 3.79, Average costs: 4.46, Total number of discharges: -0.64. Surgical: Aggregate costs: 2.79, Average costs: 3.98, Total number of discharges: -1.14, Injury: Aggregate costs: 4.37, Average costs: 3.99, Total number of discharges: 0.37. 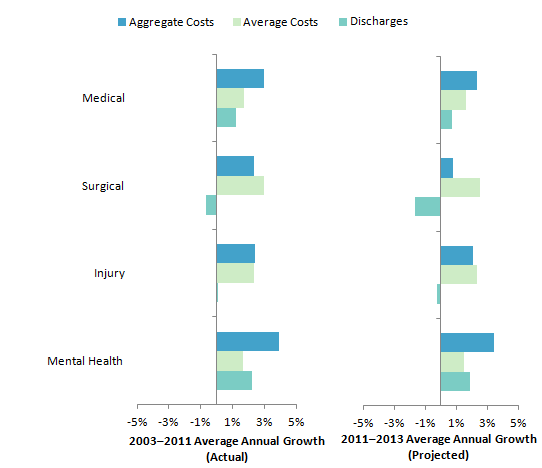 Mental health: Aggregate costs: 2.00, Average costs: 0.93, Total number of discharges: 1.07. Source: Agency for Healthcare Research and Quality (AHRQ), Center for Delivery, Organization, and Markets, Healthcare Cost and Utilization Project (HCUP), State Inpatient Databases (SID), 2003-2011, and early State discharge data, 2012. Among patients aged 0-17 years, aggregate hospital costs from 2003-2011 grew most rapidly for surgical hospitalizations but decreased for injury hospitalizations. Costs are projected to grow substantially for most hospital service lines through 2013. Between 2003 and 2011, aggregate hospital costs for patients aged 0-17 years in the surgical service line increased by an average of 4.0 percent per year. Increased surgical costs were driven by an increase in the average costs (4.8 percent), as the number of discharges declined (-0.7 percent). Aggregate hospital costs are projected to grow by at least 2 percent per year through 2013 for all hospital service lines, ranging from 2.0 percent for mental health to 4.4 percent for injury hospitalizations. Except for mental health, this growth is primarily associated with projected growth in the average costs per discharge, with little or negative growth in the number of discharges. Average hospital costs for patients aged 0-17 years grew substantially through 2011 and are projected to continue to increase rapidly through 2013 in all hospital service lines except for mental health. Average hospital costs (costs per discharge) for patients aged 0-17 years increased by an average of at least 2 percent per year from 2003 through 2011 for all types of hospitalizations except mental health (1.2 percent). Average hospital costs are projected to continue to increase at about the same rate through 2013 for mental health hospitalizations (0.9 percent) but to grow by at least 4 percent per year for the other hospital service lines. Patients aged 0-17 years experienced a decrease from 2003-2011 in all types of hospitalizations except for mental health, and these trends are generally projected to continue through 2013. Patients aged 0-17 years experienced a reduction in hospital discharges between 2003 and 2011 for all types of hospitalizations except mental health, which increased slightly at 0.5 percent average annual growth. Growth rates are projected to continue to remain negative or low through 2013 for all types of hospitalizations among this age group. Source: Agency for Healthcare Research and Quality (AHRQ), Center for Delivery, Organization, and Markets, Healthcare Cost and Utilization Project (HCUP), State Inpatient Databases (SID), 2003-2011, and early State discharge data, 2012. Figure 2. Growth in aggregate hospital costs (inflation-adjusted), average hospital costs (inflation-adjusted), and total number of discharges, adults aged 18-64 years, 2003-2013. Figure 2 is a bar graph showing the 2003 to 2011 actual average annual growth and the 2011 to 2013 projected average annual growth for medical, surgical, injury, and mental health hospitalizations. Inflation-adjusted costs are presented in 2013 dollars. Percentage of actual average annual growth, 2003 to 2011. Medical: Aggregate costs: 2.97, Average costs: 1.72, Total number of discharges: 1.22. Surgical: Aggregate costs: 2.33, Average costs: 2.99, Total number of discharges: -0.64. Injury: Aggregate costs: 2.42, Average costs: 2.33, Total number of discharges: 0.08. Mental health: Aggregate costs: 3.90, Average costs: 1.65, Total number of discharges: 2.22. Percentage of projected average annual growth, 2011 to 2013. Medical: Aggregate costs: 2.32, Average costs: 1.62, Total number of discharges: 0.69. Surgical: Aggregate costs: 0.77, Average costs: 2.51, Total number of discharges: -1.69. Injury: Aggregate costs: 2.10, Average costs: 2.36, Total number of discharges: -0.25. Mental health: Aggregate costs: 3.41, Average costs: 1.51, Total number of discharges: 1.87. Source: Agency for Healthcare Research and Quality (AHRQ), Center for Delivery, Organization, and Markets, Healthcare Cost and Utilization Project (HCUP), State Inpatient Databases (SID), 2003-2011, and early State discharge data, 2012. Among adults aged 18-64 years, aggregate hospital costs increased most rapidly for mental health hospitalizations. Aggregate hospital costs for adults aged 18-64 years increased for all hospital service lines between 2003 and 2011, with mental health hospitalizations experiencing the most rapid growth (average 3.9 percent per year). This growth is projected to continue through 2013, with costs in the mental health service line projected to increase an average of 3.4 percent per year. 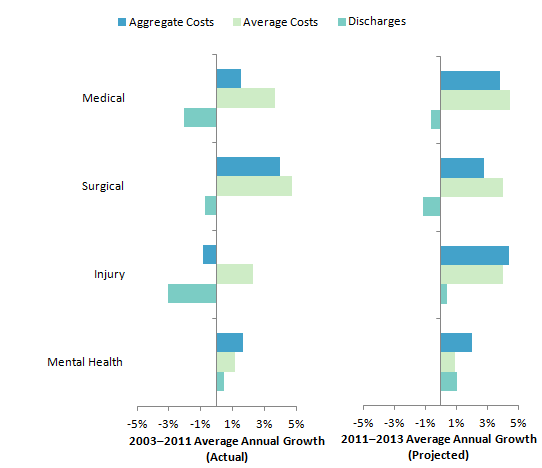 Growth in the average costs per discharge contributed to much of the overall cost growth across service lines, with the exception of mental health, which experienced even greater growth in the number of total discharges. Average hospital costs increased for all types of hospitalizations among adults aged 18-64 years. Average hospital costs for adults aged 18-64 years increased between 2003 and 2011 for all hospital service lines, ranging from 1.7 percent average growth per year (mental health and medical) to 3.0 percent (surgical). These growth rates are projected to continue through 2013 with average hospital cost annual growth rates ranging from 1.5 percent (mental health) to 2.5 percent (surgical). Among adults aged 18-64 years, hospitalizations for mental health had the most growth. Among adults aged 18-64 years, mental health hospitalizations grew most rapidly between 2003 and 2011 at 2.2 percent average growth per year. This trend is projected to continue through 2013, with 1.9 percent average annual growth in mental health discharges. The other service lines experienced slower growth, with surgical hospitalizations projected to decrease (-1.7 percent) from 2011 through 2013. Figure 3. Growth in aggregate hospital costs (inflation-adjusted), average hospital costs (inflation-adjusted), and total number of discharges, adults aged 65 years and older, 2003-2013. Figure 3 is a bar graph showing the 2003 to 2011 actual average annual growth and the 2011 to 2013 projected average annual growth for medical, surgical, injury, and mental health hospitalizations. Inflation-adjusted costs are presented in 2013 dollars. Percentage of actual average annual growth, 2003 to 2011. Medical: Aggregate costs: 1.98, Average costs: 1.44, Total number of discharges: 0.53. Surgical: Aggregate costs: 1.24, Average costs: 1.55, Total number of discharges: -0.30. Injury: Aggregate costs: 3.42, Average costs: 1.90, Total number of discharges: 1.49. Mental health: Aggregate costs: 1.90, Average costs: 1.11, Total number of discharges: 0.78. Percentage of projected average annual growth, 2011 to 2013. Medical: Aggregate costs: 1.26, Average costs: 1.28, Total number of discharges: -0.02. Surgical: Aggregate costs: 0.93, Average costs: 2.08, Total number of discharges: -1.13. Injury: Aggregate costs: 2.94, Average costs: 2.11, Total number of discharges: 0.82. Mental health: Aggregate costs: 1.00, Average costs: 1.27, Total number of discharges: -0.27. Source: Agency for Healthcare Research and Quality (AHRQ), Center for Delivery, Organization, and Markets, Healthcare Cost and Utilization Project (HCUP), State Inpatient Databases (SID), 2003-2011, and early State discharge data, 2012. Among adults aged 65 years and older, aggregate hospital costs increased most rapidly for injury hospitalizations. Aggregate hospital costs for adults aged 65 years and older increased for all hospital service lines between 2003 and 2011, with injury hospitalizations experiencing the most rapid growth (3.4 percent per year). This growth is projected to continue through 2013, with aggregate hospital costs in the injury service line projected to increase an average of 2.9 percent per year. For most of the service lines, the growth in aggregate costs was associated primarily with growth in average costs per discharge and only slightly with growth in the number of discharges. Surgery was a notable exception, where discharges fell slightly. Average hospital costs among adults aged 65 years and older grew between 1 and 2 percent per year. Average hospital costs among adults aged 65 years and older experienced relatively moderate average annual growth between 2003 and 2011 for all types of hospitalizations, ranging from 1.1 percent (mental health) to 1.9 percent (injury). Average hospital costs are projected to continue to grow at a similar annual rate through 2013, ranging from 1.3 percent (mental health and medical) to 2.1 percent (surgical and injury). There was little growth in the number of hospitalizations for adults aged 65 years and older. The total number of discharges changed relatively little between 2003 and 2011 for adults in this age group, ranging from -0.3 percent average change per year for surgical hospitalizations to 1.5 percent average change per year for injury hospitalizations. The minimal growth across all types of hospitalizations for these adults is projected to continue through 2013. National quarterly projections for 2012 and 2013 were generated using the SAS Time Series Forecasting System™ (Version 9.2).5 Projections were calculated first by State and then weighted proportionally to the nine Census divisions and the nation. For each State, the software automatically selected from among 40 different time-series models the model with the lowest mean absolute percentage error (MAPE) for that State. National quarterly trends were calculated as a weighted average of the State-level quarterly trends within each division. Each State's weight was proportional to its total number of discharges (excluding newborns), as reported in the American Hospital Association (AHA) Annual Survey of Hospitals. These AHA-based weights were used throughout the period, 2003-2012. 800-909.2, 909.4, 909.9: Fractures; dislocations; sprains and strains; intracranial injury; internal injury of thorax, abdomen, and pelvis; open wound of the head, neck, trunk, upper limb, and lower limb; injury to blood vessels; late effects of injury, poisoning, toxic effects, and other external causes, excluding those of complications of surgical and medical care and drugs, medicinal, or biological substances. 995.80-995.85: Adult maltreatment, unspecified; adult physical abuse; adult emotional or psychological abuse; adult sexual abuse; adult neglect (nutritional); other adult abuse and neglect. Surgical stays are identified by a surgical DRG. The DRG grouper first assigns the discharge to a major diagnostic category (MDC) based on the principal diagnosis. For each MDC, there is a list of procedure codes that qualify as operating room procedures. If the discharge involves an operating room procedure, it is assigned to one of the surgical DRGs within the MDC category; otherwise it is assigned to a medical DRG. Medical stays are identified by a medical DRG. The DRG grouper first assigns the discharge to an MDC based on the principal diagnosis. For each MDC, there is a list of procedure codes that qualify as operating room procedures. If the discharge involves an operating room procedure, it is assigned to one of the surgical DRGs within the MDC category; otherwise it is assigned to a medical DRG. Total hospital charges were converted to costs using HCUP Cost-to-Charge Ratios based on hospital accounting reports from the Centers for Medicare & Medicaid Services (CMS).7 Costs will reflect the actual expenses incurred in the production of hospital services, such as wages, supplies, and utility costs; charges represent the amount a hospital billed for the case. For each hospital, a hospital-wide cost-to-charge ratio is used. The CCRs are at the hospital level and are not sensitive to possible differences by hospital service line. Hospital charges reflect the amount the hospital billed for the entire hospital stay and do not include professional (physician) fees. For the purposes of this Statistical Brief, costs are reported to the nearest hundred. Quarterly cost data from the HCUP Projections8 were weighted to produce annual costs. Annual costs were inflation adjusted using the Gross Domestic Product (GDP) from the U.S. Department of Commerce, Bureau of Economic Analysis (BEA), with 2013 as the index base.9 That is, all costs are expressed in 2013 dollars. * HCUP Partners designated with an asterisk participated in AHRQ's quarterly data initiative contributing quarterly data in 2012. Weiss AJ (Truven Health Analytics), Barrett ML (M.L. Barrett, Inc.), Andrews RM (AHRQ). Trends and Projections in U.S. Hospital Costs by Patient Age, 2003-2013. HCUP Statistical Brief #176. July 2014. Agency for Healthcare Research and Quality, Rockville, MD. http://www.hcup-us.ahrq.gov/reports/statbriefs/sb176-Hospital-Cost-Projections-by-Age-2013.pdf. Acknowledgments The authors would like to acknowledge the contributions of Clare Sun of Truven Health Analytics. 1 Pfuntner A, Wier LM, Steiner C. Costs for hospital stays in the United States, 2011. HCUP Statistical Brief #168. December 2013. Agency for Healthcare Research and Quality, Rockville, MD. http://www.hcup-us.ahrq.gov/reports/statbriefs/sb168-Hospital-Costs-United-States-2011.pdf. Accessed January 28, 2014. 4 Complete and detailed description, methodology, data, and projections are provided in the following report: Steiner C, Andrews R, Barrett M, Weiss A. HCUP Projections: Cost of Inpatient Discharges 2012 to 2013. HCUP Projections Report #2013-01. December 11, 2013. U.S. Agency for Healthcare Research and Quality. http://www.hcup-us.ahrq.gov/reports/projections/2013-01.pdf. Accessed January 31, 2014. 6 HCUP Clinical Classifications Software (CCS). Healthcare Cost and Utilization Project (HCUP). U.S. Agency for Healthcare Research and Quality, Rockville, MD. Updated April 2014. http://www.hcup-us.ahrq.gov/toolssoftware/ccs/ccs.jsp. Accessed April 14, 2013. 7 HCUP Cost-to-Charge Ratio (CCR) Files. Healthcare Cost and Utilization Project (HCUP). 2001-2011. U.S. Agency for Healthcare Research and Quality, Rockville, MD. Updated August 2013. http://www.hcup-us.ahrq.gov/db/state/costtocharge.jsp. Accessed December 13, 2013. 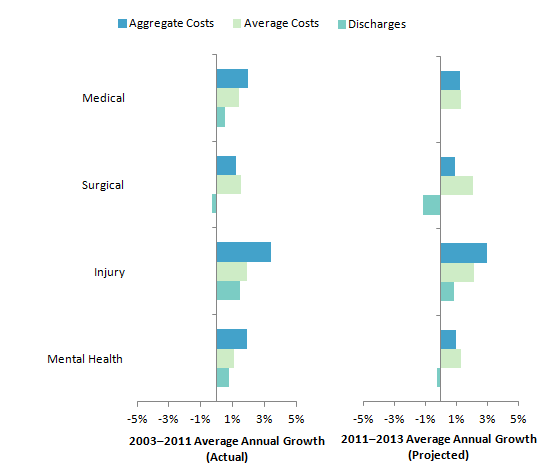 8 Steiner C, Andrews R, Barrett M, Weiss A. HCUP Projections: Cost of Inpatient Discharges 2012 to 2013. HCUP Projections Report #2013-01. December 11, 2013. U.S. Agency for Healthcare Research and Quality. Rockville, MD. http://www.hcup-us.ahrq.gov/reports/projections/2013-01.pdf. Accessed January 31, 2014. Internet Citation: Statistical Brief #177. Healthcare Cost and Utilization Project (HCUP). July 2014. Agency for Healthcare Research and Quality, Rockville, MD. www.hcup-us.ahrq.gov/reports/statbriefs/sb176-Hospital-Cost-Projections-by-Age-2013.jsp.